Here is a fabby recipe that I use quite frequently. You can add herbs and spices to your own taste. I also find these dumplings, once refrigerated, can even be used to take in to work for a midday snack in your lunch box as they firm up quite nicely! Add eggs and half the cheese, mix well again and stir until potatoes firm up. 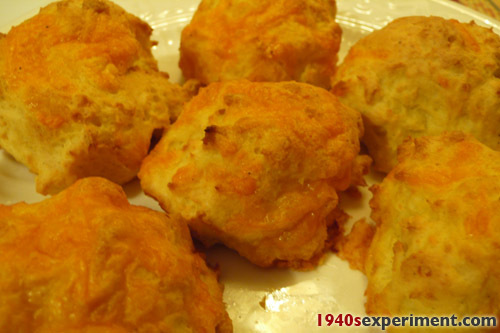 This entry was posted in Uncategorized and tagged 1940sexperiment, carolyn ekins hyland, cheese and potato dumplings, wartime dumplings, wartime recipes. Bookmark the permalink. ← We are connected and 273 lb by Christmas. I have made these dumplings in the past. They are SO delish! I had to quit making them because I ate to many – well, you know how that works…..
Oh my these look so good that I think I’ll have to try them too! 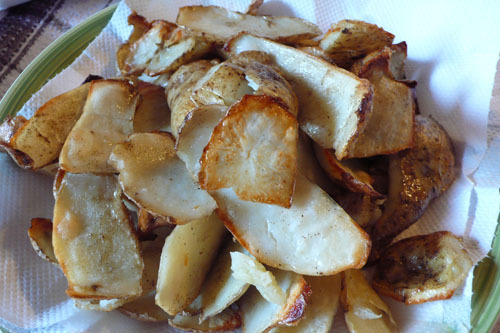 And this is what I save potato peelings for if I HAVE to remove the skins from potatoes! I HATE to waste anything!!! Dear Richard- I am a dietary vegan and have been so since October 1st, 2011. You are probably reading a recipe that I made prior to becoming a vegan. While I applaud your principles, it is people like yourself that give veganism and the Vegan Society a bad name by being so hostile to other folk before taking time to find out the full details instead of attacking me or others in such a hateful manner? And during the war people ate far less meat and dairy and although in an ideal world, they wouldn’t eat any at all, eating a 1940s rationing diet is a BIG STEP in the right direction, getting off the junk processed food, eating very small amounts of animal flesh and cheese and moving towards a mostly plant based diet…. anyone making the change to this from mindlessly consuming huge amounts from animal food should be APPLAUDED. It’s a step in the right direction! I am contacting the Vegan Society again as I still am waiting to hear from them regarding alternatives offered to Vegans during the latter part of the war (as you probably know the founder of the Vegan society formed it during the war and he used to produce a newsletter) and I’ll forward them a link to these comments- hopefully they can offer some input to 1940s veganism. And BTW everyday I work very hard indeed to be true to veganism. Calm down, take a nap, and stop being such a trolling drama queen. Oh, and learn how to use the spell check. I know that when you’re very very young and full of wild/poorly considered enthusiasms you think that ranting at strangers half-cocked will save the world, but really it just makes you look like a pillock, and (more importantly) it undermines the credibility of those of us who have been at this a wee bit longer and have slightly more sense. Someone who’s probably been vegan longer than you’ve been breathing. You are amazing! Thanks for the advice regarding baked potato peeling snacks! Ive gotten so many wonderful ideas from your website and I will try Marmite and aybe even Vegamite for use as spreads. This is a superb and tempting recipe. I shall be enjoying these cheesy dumplings tomorrow! And thanks for all the other recipes on the 100 War Time list. Really great stuff. Happy new year to all. Just in the middle of making these at the moment to have with roast beef, steamed vegies, cheese sauce and a red wine, onion and prune gravy………….cannot wait………..love that they are baked and not boiled like other dumpling recipes I saw! Will let you know how delishhhhhhh it is!!! Being long time and really committed vegan myself I do feel strongly BUT I dont feel the need to have a go at you nor anyone else. I do share, what I hope to be, bydgetband tasty vegan dishes to help others get over panic about vegans eat lettuce and I’m hungry! I am very happy you have decided to be vegan and good luck as there can be changes to learn that are a bit stressful for newbies. Question, How hot is a hot oven? I’m new to the cooking realm and not sure what temp. to set the oven… help! Old vegan here, never felt urges to have a go at others nor be rude like that. Being vegan does not equate to rabid dog. I just substitute, we all do. Vegans are not like that and it’s probably someone young, new to it and a big overcome. Great answer Caroline, I was really pleased to note your transition but used your recipes, my way, long since. No problems nor with the gf side mostly. So no need for pallava.